- Publisher Keep your preschoolers involved in creative, active learning with Instant Bible Lessons for Preschoolers. Patterned after Rainbows best selling Instant Bible Lessons series for ages 5-10, these reproducible books offer everything you need to teach preschoolers in eight extended sessions. From puzzles, to games to crafts and snacks, each themed lesson provides flexibility as you shape the message to you preschool class. 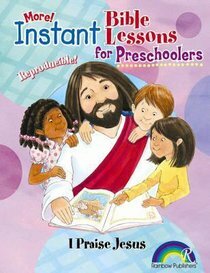 About "I Praise Jesus (Instant Bible Lessons Series)"
Keep your preschoolers involved in creative, active learning with Instant Bible Lessons for Preschoolers. Patterned after Rainbows best selling Instant Bible Lessons series for ages 5-10, these reproducible books offer everything you need to teach preschoolers in eight extended sessions. From puzzles, to games to crafts and snacks, each themed lesson provides flexibility as you shape the message to you preschool class.